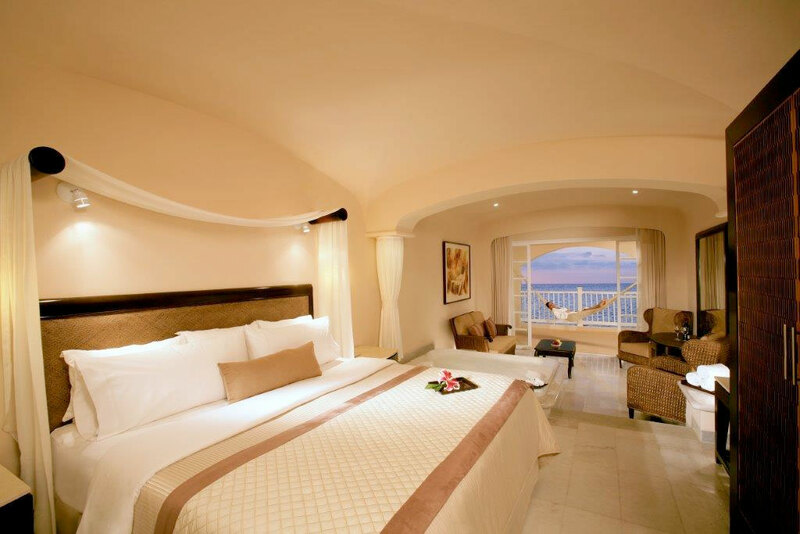 Junior Suite – Ocean View – 1 King or 2 dbl beds. Seating area. Double Jacuzzi, In Room Wine & Fruits. Private bath with shower only. Balcony (most with a hammock). Liquor dispenser containing whiskey, tequila, rum & vodka. Mini bar containing sodas, bottled water & domestic beer. Satellite TV & PayPerView. Purified water. Farouk Biosilk Bath Amenities. Bathrobes & Slippers. Digital safe (laptop size). Individually-Controlled A/C. Coffee maker. Direct dial telephone. Alarm Clock. Hair dryer. Iron/ironing board. Wireless Internet. 24 Hour room service & Turndown Service. Non-Smoking rooms available. 1 Physically Challenged room. Ocean View. Max Occupancy: 4 guests including children & infants. Room size: 581 Sq.Ft. Concierge Level – King bed. Seating area. Double Jacuzzi, In Room Wine and Fruits. Private bath w/ shower only. Balcony w/ a hammock. Liquor dispenser contains premium, upgraded brands of liquor: Bacardi White Rum, Jose Cuervo Tequila, J&B Whisky and Barton Vodka. Mini bar containing sodas, bottled water & domestic beer. Satellite TV & PayPerView, DVD Player, CD Player. Purified water. L’OCCITANE Bath Amenities. Bathrobes & Slippers. Aromatherapy. Two (2) 25 Minute Massages. Digital safe (laptop size). Individually-Controlled A/C. Espresso/American Coffee maker. Direct dial telephone. Alarm Clock/Radio/IPOD Dock. Professional Hair dryer. Iron/ironing board. Wireless Internet. 24 Hour room service from select restaurant’s to create to a “Special Menu”. Nightly Petit Fours, Pillow Menu & Nightly Turndown Service. Exclusive Concierge Phone Service, Private check-in & out/Late check-out and Early check-in (subject to availability). Non-Smoking rooms only. Ocean View. Max Occupancy: 2 guests, adults only. Room size: 581 Sq. Ft.
Loft Suites – 2-story units – lower level with 1 Bedroom w/king size bed, Double Jacuzzi, & private bath w/ shower only. Upper level with 1 Bedroom w/double beds, Double Jacuzzi & private bath w/ shower only. Balcony w/hammock. Living Room. In Room Wine and Fruits. Seating Area. Liquor Dispenser contains whiskey, tequila, rum & vodka. Mini Bar contains sodas, bottled water & domestic beer. Satellite TV & PayPerView. Purified Water. Farouk Biosilk Bath Amenities. Bathrobes & Slippers. Digital safe (laptop size). Individually-Controlled A/C. Coffee Maker. Direct Dial telephone. Alarm Clock. Hair Dryer. Iron/ironing board. Wireless Internet. 24-Hour room service & Turndown Service. Ocean View. Max Occupancy: 4 adults & 2 children (6 guests). Room size: 827 Sq. Ft. Flamingos Bar: Pool side bar during the day; grill, fine cuts served at night. 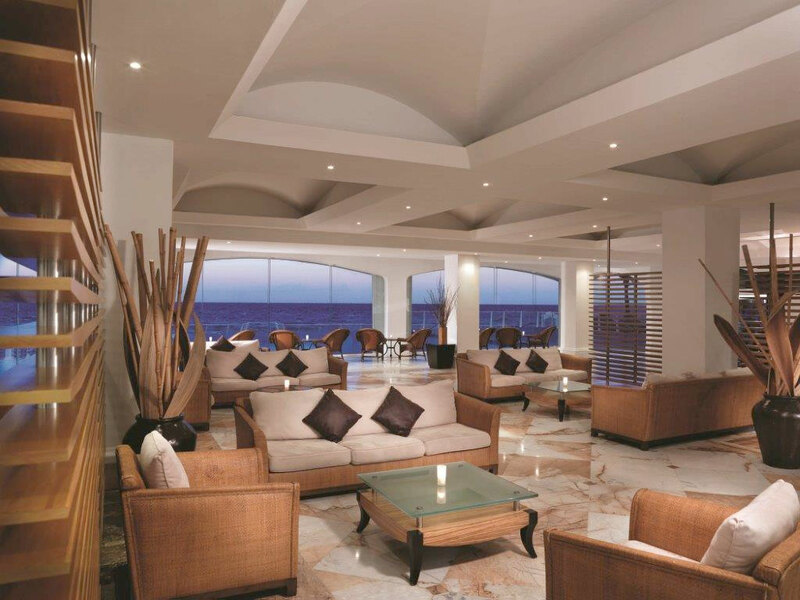 The Lobby Bar: Make yourself at home while you kick back and relax infront of our big screen TV and satellite system for special event broadcasts. Our daily happy hour is from 6:00pm to 7:00pm with lively music for your entertainment. MoMoNoHaNa: Oriental a la carte cuisine (dinner). Long pants, collared shirts and shoes required in Bugambilias and MoMoNoHaNa restaurants. Choose from an array of choices and possibilities… your package includes a quantity of Resort Credit Dollars, depending on your length of stay (a 7 night stay gets 1500 Resort Dollars per room) – use towards SCUBA diving, tours, adventures, spa services & more! Resort Credits may be carried over for one year to a future visit. Please note there is a 16% tax paid to the hotel on Resort Credits used. 5-8 NIGHT STAYS receive 1500 Resort Credits per room! 4 NIGHT STAYS receive 750 Resort Credits per room! 3 NIGHT STAYS receive 500 Resort Credits per room! Spend your Resort Credits however you like (max 300 in the spa). Spend your Resort Credits however you like (max 150 in the spa). Spend your Resort Credits however you like (max 100 in the spa). 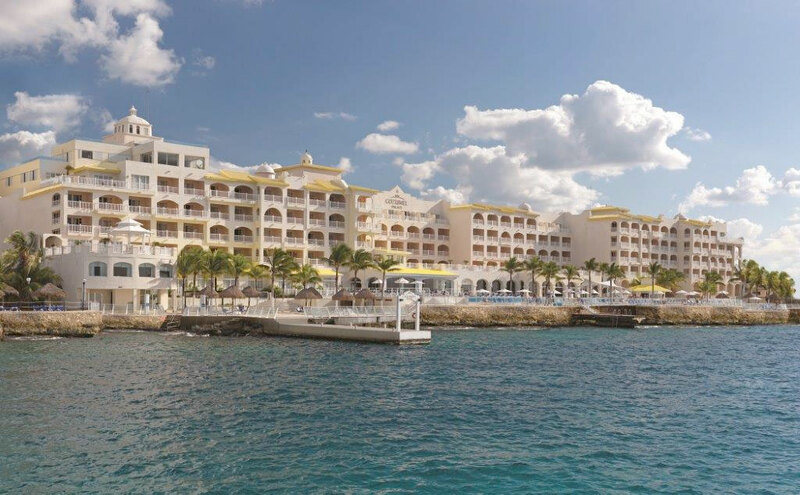 Reservations for services and amenities are requested at the resort upon arrival and are subject to availability, with the exception of SCUBA Diving – we will confirm your diving in advance of arrival. Resort Dollars used for diving are pre-deducted from available Resort Credit Dollars and are nonrefundable. * Weddings: Wedding dates and packages are subject to availability. Resort Dollars are redeemable towards the purchase of a Wedding Collection package (Resort Dollars cannot be applied towards optional services or extras). The complimentary package continues to be available as an additional option. 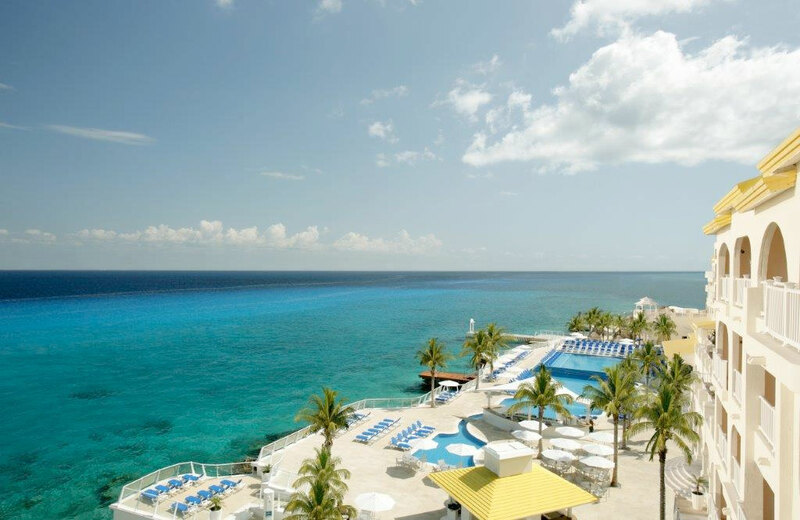 ** many of our Cozumel Palace guests use Dive Paradise – please inquire about special discount rates to continue to dive with Dive Paradise, and use your Resort Dollars to pamper yourself in the spa, enjoy a tour or other adventures!